I am unfamiliar with the climbing form of hydrangea, or at least I was before I researched it for this blog post. I will be moving soon into a house of my own where I plan to do lots of gardening so I need to know what is available for my area of the country. I live in growing zone 5 so my plants have to be able to withstand cold and lots of snow cover. Always check before you buy plants online to make sure they are suitable for your area. 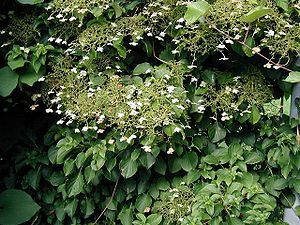 The petiolaris, or climbing hydrangea plant, can be used as a ground cover as well as a climber. The blooms are white and lacey looking and show up around the month of June and the leaves are heart-shaped and green. If you want this flowering vine to climb, then plant it near a sturdy structure that will be able to bear the weight of the full grown bush which can be up to 50 feet in height… yikes! That is big, so think long term when planting this one. It likes shade or semi-shaded areas which is good to know since my new yard will be surrounded by trees and I’m assuming will be quite shady most of the day. I like the idea of planting it to cover an unsightly tree stump (I have a tall one in my new yard) or some other part of the yard that isn’t very nice looking. According to what I’ve read, it takes a year or two to get established and then it takes off and grows like crazy. Scroll down this page at Dave’s Garden site and read what people who are growing this plant have to say. Check with local nurseries to purchase. Next Post Hydrangea Flower Stickers – Add a Photo!